Confession time….I despise picking peas. Ever since we worked at Hutchins Farm (years ago) I have had strong feelings towards picking peas. I’m haunted by hot summer days hunched over the peas harvesting bucket after bucket for hours on end. It’s always been a chore I never enjoy but hot damn…peas are the best! So despite my sour feelings towards actually harvesting them I really do love them in the end. This dish was a reward to myself after an epically long and hot day harvesting peas at Tumbleweed. I was inspired to make this recipe from a green bean dish in the latest issue of Real Simple Magazine and adapted it to what we had on hand. The peas are lightly blanched and then tossed in a lovely miso and mustard sauce. 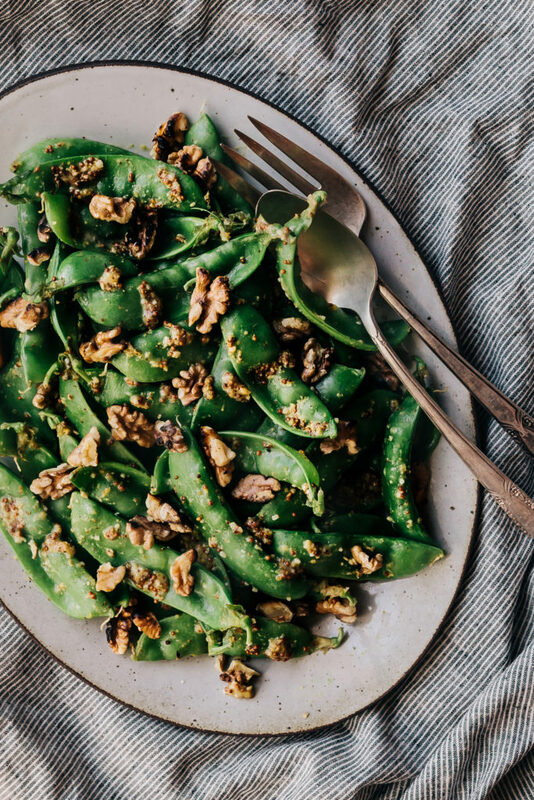 I topped the salad with a few toasted walnuts for a simple and flavorful summertime side dish. This salad would be a great addition to grilled chicken or fish and pairs really well with a glass of dry white wine. And since the original recipe calls for green beans I’ll be thrilled to prepare this once the beans come in (another task I’m not very fond of!) Luckily, there are wonderful ways to prepare some of the most physically exhausting veggies we grow. In the end the veggies always win because our taste buds are dancing. I hope you all enjoy this salad as much as we do. Grab a fork, pour a glass and dig in! Heat a medium sized dry skillet over medium-high heat. Add the walnut and cook, shaking the pan often, until toasted. About 5 minutes. Remove from the heat and set aside. When cool enough to handle roughly chop them. Bring a large pot of lightly salted water to a boil. Fill a large bowl with ice water and keep it to the side. Add the snow peas and cook until crips tender and bright green. About 45 seconds. Keep a close eye on the snow peas as they can overcook quickly. Transfer the peas to the ice water to cool and then pat dry with a clean kitchen towel. In a large bowl whisk together the miso, mustard, oil, vinegar and honey. Season with a pinch of salt and pepper. Add the snow peas to the bowl and toss until well coated. Transfer to a platter and sprinkle with the toasted walnuts. How could you dislike peas? Well to be honest, I don’t really like them as well, but peas in edible pods are a different matter. I love just boiling them, they’re so sweet. The miso mustard you suggested sounds like a delicious way to serve them as well! Had my first shell peas from Hutchins yesterday. Now I feel guilty! Well, not entirely. I actually ate half of them raw like popcorn. So good. As I have become more seasonal in my eating choices, I tend to gorge when things are fresh and ignore them the rest of the year. This recipe sounds great and I agree with you that it would work with a whole range of veggies (read broccoli). Guess I am off to the Hutch for snow peas.